Sep - 23 | By: Anne Richardson | no comments. 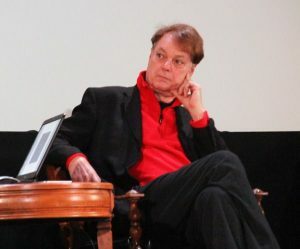 On Oct 15, 2016, two time Oscar nominee Bill Plympton will appear as a guest speaker at Oregon Cartoon Institute‘s one day symposium UNDERGROUND USA. The following evening he will introduce a program of his short films at the Mission Theater. UNDERGROUND USA is one day public history/arts education event which focuses on one chapter of Oregon print cartooning history. It was created in partnership with UO Comics & Cartooning Studies and PSU Comic Studies, and with support from Oregon Historical Society. Six writers and artists, Bill Plympton, David Chelsea, Norman Solomon, Richard Gehr, Maurice Isserman, Patrick Rosenkranz, are coming to the White Stag Auditorium to taIk about their earIy experiences in Portland’s underground press. Among the questions they will address: What makes Portland so comics and cartooning friendly? Future Oscar nominee Bill Plympton drew covers for the Portland Scribe. Journalist Norman Solomon wrote for it. Historian Maurice Isserman edited it. Graphic novelist David Chelsea illustrated it. Village Voice columnist Richard Gehr sold it on the street. What was the underground press? What role did underground comics play in creating the sensibility of the underground press? Was Portland’s current affinity for comics/cartooning already in evidence during this forgotten period of regional media making? Through talks, presentations, onstage conversations and a culminating panel discussion, UNDERGROUND USA participants will explore these and other questions. Patrick Rosenkranz, author of Rebel Visions: The Underground Comix Revolution 1963-1975, will give the keynote address. He will speak about two powerfully influential pop culture practitioners from Oregon, Carl Barks (1901-2000) and Basil Wolverton (1909-1978), and the impact they had on the cartoonists of the underground press. General admission: $60, Faculty/teachers (with ID), $40. Students (with ID): $30. Thanks to support received from Kinsman Foundation, Miller Foundation, and Oregon Historical Society, Oregon Cartoon Institute is able to offer reduced prices for educators, and half price admission for students. Yes, there will be coffee and (Voodoo) doughnuts!